Left: Climber, C3. 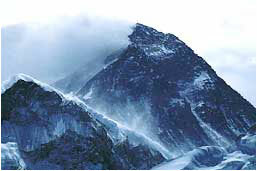 Right: Everest summit at storm. A Millenium ago, The Himalayas were an unreachable cold and hostile place on earth. The mountains led a life of their own, dominant and imposing over the area. The high ranges were as difficult to reach for humans as the stars in the sky are today. 500 years later, humans started to settle in the valleys. Their blood grew thick to accustom to the altitude and their skin hardened to endure the cold. But Mount Everest still remained a remote place, never visited by humans and still only vaguely known to the western world. Sometimes, the locals would peer to Everest's jetwind-plagued summit in the distance. They imagined a frightening, grand place surely inhabited by snowmen and ghosts. Thus was Everest named Chomalongma - "Mother of Earth" in Tibet, and Sagarmatha - "Mother of all goddesses" in Nepal. Today, just months before the Millennium ends, Everest is climbed by man. Click on image to view larger: Yaks with expedition gear. The summit, finally scaled by humans just 50 years ago and piercing the atmosphere where the sky changes into a dark blue, now marks our next frontier; the Universe. Yet, Everest has not given itself easily. It has claimed many climbers� souls for their pursuit of the summit. And it still does. Today, the summit has still had fewer visitors than the space. Yet, it has taken far more lives. The reason is the unpredictable mood of the mountain and the extreme hostility of the environment, defended against by humans with simply extra layers of fabrics covering their bodies and a few small oxygen tanks carried on their backs. The climbers, driven by curiosity to explore the unknown or the urge to conquer the seemingly impossible, have turned themselves into human guinea pigs whilst pursuing their dreams. Sometimes admired, sometimes ridiculed by the world. Tales of successes and whispers of failures still surround the climbers on Mount Everest each year. Click on image to view larger: Tina, C3. - I have a dream too, he said. I want to sleep on the summit. The expedition went very well, but to our great disappointment, did not lead to our success this time either. Once again, we had to turn from the summit, this time only 95 meters from our goal. Frustrated, we spent a restless night in our high camp. In the morning we were decided - to try again next year. But this time also to help Babu with his dream. Thus hopefully, celebrating the New Year of 2000, we will have finally summited Everest together and man has slept on top of the world.